When you’re trying to make the most out of your backyard, it’s natural to want all the space you can get. However, one of the most common mistakes we see with fence installations is fences that are built directly on or over the property line. Make no mistake – building a fence right on your property line is a dangerous gamble, and you could regret it in the long run. Find out why below. You have probably heard the phrase “good fences make good neighbors.” However, fences can also cause neighbor disputes, and one of the most common is disputes about where one person’s land stops and another one’s begins. What does that mean for you? In short, if you want to build a fence around your lawn and your neighbor doesn’t want to pay for part of it, make sure you build away from the property line. If you build on the line, your neighbor can still build up against it and use it as part of his or her lawn enclosure, but doesn’t need to pay for it or maintain it in any way. It’s all your responsibility. Furthermore, if you build on the property line, you could be forced to tear up and move your fence later on. For instance, if a survey finds your fence is over the line at all, or if a new neighbor wants to build right up to their side of the line, they could take you to court over your fence. Unless you want to spend thousands of dollars on legal fees and fence removal, it’s better to be safe than sorry. The best way to make sure your fence doesn’t cause any neighbor problems is to keep it on your property. Get a survey of the property lines done and then have your fence built six inches to a foot on your side. If you’re worried about how your neighbors will react to your new fence, you can share plans for your design ahead of time. They may even want to contribute to the costs of building it in exchange for being able to use their side of the fence on their own property as well. If you do choose to share your fence, you should look into the laws and make sure you know what your responsibilities are. Whether your neighbors decide to help with the costs of your fence or not, you should always plan to build it with the finished side of the fence facing them. This is simply good etiquette, and will help prevent any complaints from your neighbors later on. Finally, it’s important to keep your fence clean and in good repair, even if it encloses part of your neighbor’s property. Fortunately, if you get a vinyl fence from Future Outdoors, your maintenance needs will be minimal and your fence will last much longer than any wood fence. Looking for a new fence in the Dallas area? Contact us today at Future Outdoors. 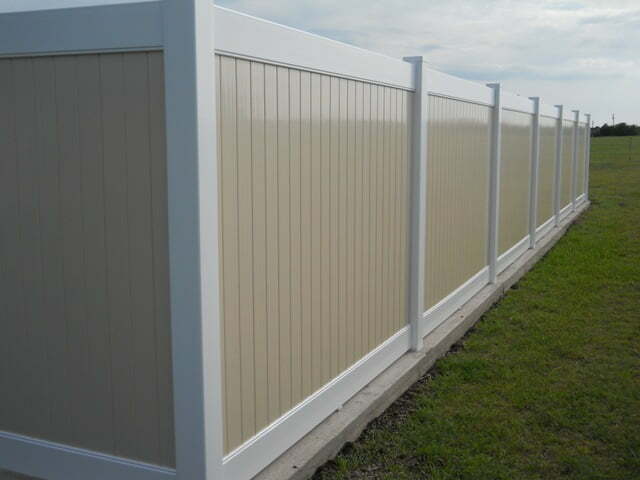 We’ll build you a quality vinyl fence that won’t make your neighbors mad. Call (972) 576-1600 today to get a free estimate, or visit us on Facebook to see pictures of past projects and read reviews from other satisfied customers.